Morse Can Tumblers provide aggressive corner-over-corner mixing action. 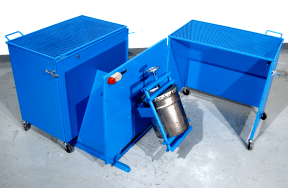 Mix products right inside your sealed cans or pails with these can rotators to reduce hazards and save clean-up. Use your pail and can mixer to blend the contents of closed 1 to 5 gallon pails or cans (4 to 20 liter pails or cans). 20 Liter Can Tumbler. 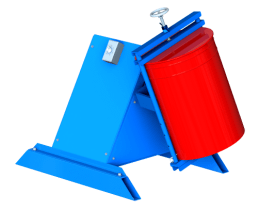 Can Tumblers rotate pails continuously in one direction. 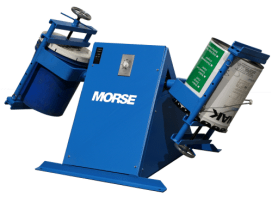 Morse 5 gallon pail mixers do NOT shake or oscillate cans. 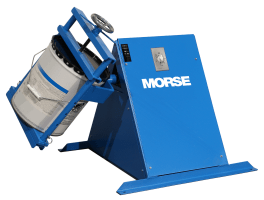 Please note: Morse 5-Gallon Can Tumblers rotate pails at a constant 23 RPM in one direction. They are NOT can shakers, as they do NOT shake or oscillate cans. 5-Gallon Can Mixer base dimensions: 28" x 28" (71 x 71 cm). See Can Tumbler Spec Sheet for other dimensions. Single phase, 115V TEFC version on model 2-305-1 or 1-305-1 includes a timer you set at 1 to 60 minutes for automatic shut-off. Timer is NOT available on other 5-gallon pail mixer models. Air motors are also available. Air motors are vane-type and require correctly sized filter, regulator, lubricator, valve (FRL) and piping supplied by customer. See Air Motor Technical Information. Filter, regulator and lubricator (FRL) for air powered pail mixer may be ordered from Morse. IMPORTANT NOTE: Require larger enclosures than standard can tumblers. 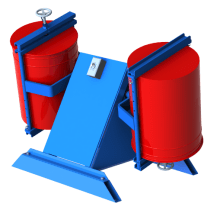 Single Can Tumbler shown with option to mix a larger can installed. 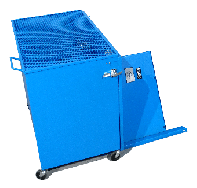 Option XLC-1-305 includes a raised base for the Can Tumbler and 1 larger can holder. at 23 RPM 1/4 HP TEFC with 1 to 60 Minute Timer 115V 60 1 5 205 Lb. at 19 RPM 1/2 HP TEFC 110 / 220V 50 1 7.2 / 3.6 205 Lb. at 23 RPM 1/4 HP TEFC 208 / 230V 60 1 3.0 / 2.5 205 Lb. at 23 RPM 1/4 HP TEFC 208 / 230 / 460V 60 3 1.7 / 1.3 / .7 205 Lb. at 19 RPM 1/4 HP TENV 190 / 380V 50 3 1.2 / .6 205 Lb. at 23 RPM 1/2 HP TEFC 575V 60 3 .8 205 Lb. at 23 RPM 1/4 HP Air Motor (Technical Info) - - - - 190 Lb. at 23 RPM 1/4 HP Explosion Proof 115 / 208-230V 60 1 5 / 2.6-2.5 210 Lb. at 19 RPM 1/4 HP Explosion Proof 110 / 220V 50 1 5.2 / 2.6 210 Lb. at 23 RPM 1/4 HP Explosion Proof 208-230 / 460V 60 3 1.4-1.3 / .7 231 Lb. at 19 RPM 1/2 HP Explosion Proof 230 / 400V 50 3 1.7 / 1.0 231 Lb. at 23 RPM 1/2 HP Explosion Proof 575V 60 3 .7 231 Lb. at 23 RPM 1/4 HP TEFC with 1 to 60 Minute Timer 115V 60 1 5 175 Lb. at 19 RPM 1/2 HP TEFC 110 / 220V 50 1 7.2 / 3.6 175 Lb. at 23 RPM 1/4 HP TEFC 208 / 230V 60 1 3.0 / 2.5 175 Lb. at 23 RPM 1/4 HP TEFC 208 / 230 / 460V 60 3 1.7 / 1.3 / .7 155 Lb. at 19 RPM 1/4 HP TENV 190 / 380V 50 3 1.2 / .6 155 Lb. at 23 RPM 1/2 HP TEFC 575V 60 3 .8 155 Lb. at 23 RPM 1/4 HP Air Motor (Technical Info) - - - - 155 Lb. at 23 RPM 1/4 HP Explosion Proof 115 / 208-230V 60 1 5 / 2.6-2.5 180 Lb. at 19 RPM 1/4 HP Explosion Proof 110 / 220V 50 1 5.2 / 2.6 180 Lb. at 23 RPM 1/4 HP Explosion Proof 208-230 / 460V 60 3 1.4-1.3 / .7 180 Lb. at 19 RPM 1/2 HP Explosion Proof 230 / 400V 50 3 1.7 / 1.0 180 Lb. at 23 RPM 1/2 HP Explosion Proof 575V 60 3 .7 180 Lb. ONLY Single-phase 60Hz NON-explosion-proof can tumblers (models 1-305-1 and 2-305-1) are equipped with 60 minute timer, and plug into standard 115V wall outlet. All other Morse can tumblers are shipped without control, cord and plug... and must be installed by an electrician according to local codes and customer's preference. Air powered models require plant air at 40 psi and flowing at a rate of 22 scfm. Filter, Regulator, Lubricator and valve (part # 90010-P) should be installed in the air line ahead of the motor. 5-Gallon Can Tumblers - Pail, Can or Bucket Mixers - Morse can tumblers provide aggressive corner-over-corner mixing action to mix the contents of sealed 1 to 5 gallon pails (4 to 20 liter pails). 20 Liter can tumbler.